2 jalapeño peppers, seeded and cut 10 pieces, about ½”x ½”. 10 chunks sharp white cheddar cheese, about 1.5 oz. 10 chunks pepperoni, about 1.5 oz. 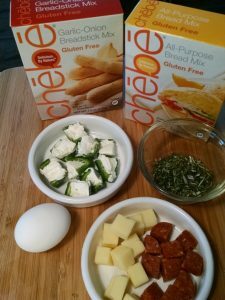 Prepare the Chebe mix according to package directions until the dough is smooth and consistent. Separate into 31 equal pieces (each piece will be about 1 oz). Roll each piece into a smooth, rounded ball. Combine two of these pieces into one, making a larger ball (this will be the base of the tree). Cut the pepperoni, cheddar cheese, and jalapenos and fill the jalapeno pieces with dabs of cream cheese. 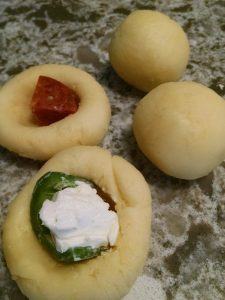 With your finger, press a cavity in each ball and insert a jalapeno, a piece of cream cheese, or a pepperoni and enclose the filling with the dough. Seal the opening and roll into a smooth ball. 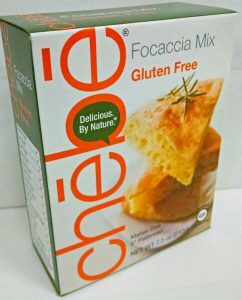 Lightly grease or spray oil onto a baking pan/sheet. 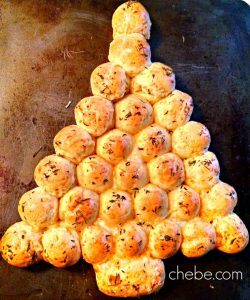 To form the tree, place on the pan a row of seven balls, above that row, a row of six balls, above that, a row of 5, etc. making a pyramid until you finish the tree. The larger ball can be flattened a little and placed below the bottom row to make the tree base. 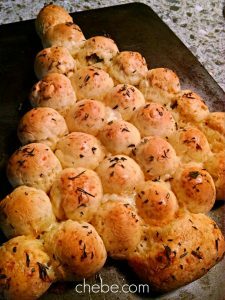 All dough balls should be lightly touching each other. Make the egg wash by mixing 1 egg with 2 Tbsp water or milk. Brush the egg wash all over the surface and the edges of the tree. 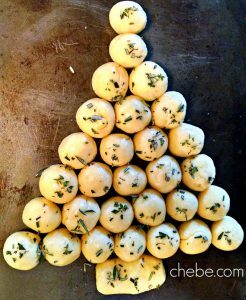 Sprinkle the tree with the chopped herbs. 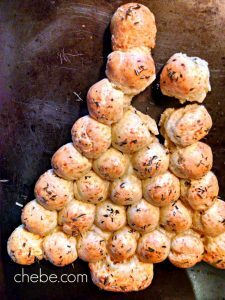 Bake for 25 – 27 minutes. Rotate the pan half way through baking to be sure it is more evenly baked. Keep an eye on it during the last five minutes. Remove from the oven and let rest for 10 minutes. Enjoy. You may make a smaller tree by halving the ingredients. Make 16 to 17 balls and construct the tree in the same way. Other filling ideas: sundried tomatoes, pesto, black olives and cream cheese, cooked bacon, etc. Can I make this the say before? If you make this ahead of time it should be kept in the freezer until the day you are ready to serve it. To bake it from a frozen state, you should add about ten minutes to the bake time. This is a general rule. Keep an eye on it after 7 or 8 minutes.